With 2010-11 SP Authentic, one of sports cards premier brands takes on one of America's most beloved team sports, College Basketball. After a year away from the hard court, SP Authentic returns to capture the college days of some of basketball's biggest names. SP By the Letter Rookies, Veterans, and Legends Autographs! Classic Holo-FX die inserts fall 1:6 packs, also look for rare die-cut versions! Michael Jordan Supreme Court Relics and Relic Autographs featuring an actual piece of North Carolina Tar Heels court! 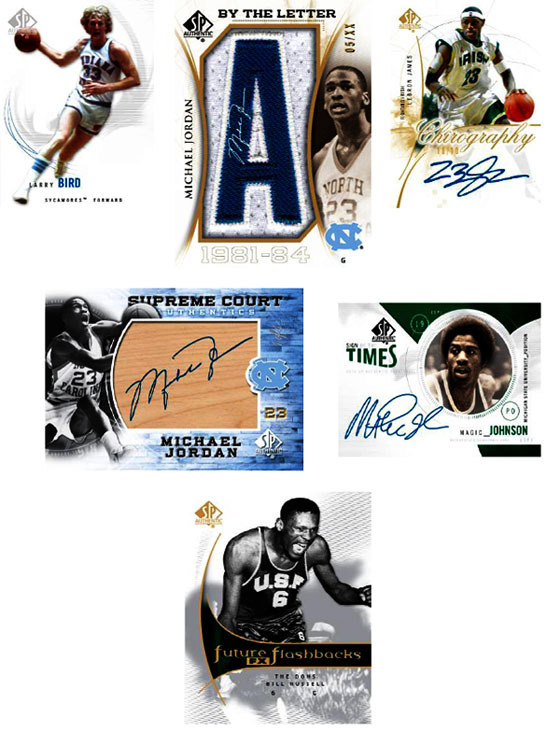 Collect Championship players and coaches with Cutting Down The Nets, Supreme Court, Future F/X Flashbacks, and Authentic Top 10 Inserts featuring: Coach K, Roy Williams, Tom Izzo, Magic, Michael, Bird, Irving, Steve Alford, Jerry West, and more! 2010-11 SP AUTHENTIC BASKETBALL HOBBY 12 BOX CASE - JORDAN LEBRON KAWHI RC AUTO? Although I pulled an MJ Floor Auto card and an Ultra Rare (5/5) one at that, the rest of the product was woeful. An Xavier Henry Auto patch and 4 FX cards would be rotten if I hadn’t gotten the MJ auto. UD is just very unimpressive to me these days. It is really sad to see this once great giant being reduced to thrid and fourth rate products. I have bought about 100 Panini and Topps boxes in the past year and no more than 5 UD boxes in that same time frame. It is just really sad what UD has become. I only hope they get back to where they once were after Panini goes in the toilet the way they are just overspending and mass producing everything. All-in-all, this SPA box was just really not good and just getting the MJ card was great but if it wasn’t for that I think I would have been ticked abt getting $15 worth of cards for a $125 box.